I’m sure the idea of building your very own two-seater electric race car has probably crossed the minds of those of you reading about alternative news with us. And that often brushed aside thought can now become a reality thanks to a home electric racer kit called the iRACER. Introducing The iRACER. The idea behind this electric do-it-at-home electric car racer kit came from Birmingham City University and Westfield Sportscars. According to GizMag, The iRACER is a pure electric car designed to educate, excite, while contributing to emissions-free sport racing. Don’t get your hopes too high, this is a race vehicles and getting this DOTed would take a little patience and ingenuity. Technically Speaking. Weighing in at 1700 lbs, the iRACER tops Formula 1 with the 440 lb lithium iron phosphate 23 kWh battery pack it needs to carry has enough energy for about a 25 minutes race. Electric motor wise, The iRACER uses two YASA-750 electric motors on each of the rear wheels weigh 55 lb that can deliver 100 kW (132 hp) at 2000 rpm with295 ft-lb of torque continuously and 550 ft-lb peak. All of this gives the iRACER a 0 to 60 in about 5 seconds. Each of the iRACER’s motor is usually limited to 45 kW (60 hp), as well as the top speed limited electronically to 185 km/h (115 mph) but it has shown speeds of up to 130-140 mph without the limiter. And if that isn’t enough for you overtaking another electric racer, the iRACER comes with a “boost” button, enough to deliver the full 132 hp at once, which drains a kilowatt-hour from the batteries every 18 seconds! Where Can It Be Raced? 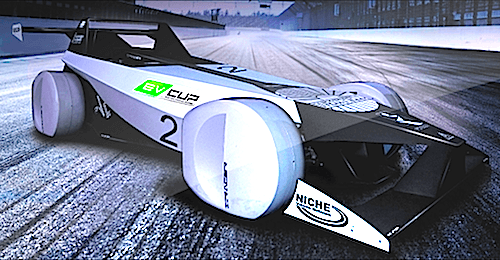 So far, the EV Cup is the place to go (www.evcup.com) The EV Cup aims to get electric car race, in single seater and prototype layout. On another note, the iRACER can accommodate various propulsion platforms, including hybrid, plug-in hybrid and internal combustion engines. There is even a Sports Prototype version. How Much? At this time, the iRACER kit is aiming for approximately $20,850. And as with most electric toys, it doesn’t come with batteries, not even the electric motors. The final estimates would closer to $60,000. If you are interested, the kit can be purchased by Westfield Sportscars. Nonetheless, this is still one affordable to get into the racing business. If the 1960s are gone almost anyone had the possibility to just “climb in” and win a race, today’s competitive landscape is quite another world. Needless to say, without a highly favorable back, modern day racing is exorbitant. So congratulations to the Birmingham City University and Westfield Sportscars venture for bringing us this tantalizing electric car racer kit called iRACER.